The Medicomat oMass Smart Massager is the world's first mobile-based acupuncture massage device designed for fully automatic treatment of chronic pain, fatigue, anxiety, stress, depression, high/low blood pressure, aches, body relaxation... Users can control all the features of Medicomat oMass through a user-friendly app. The Medicomat oMass is easy to use, portable, and offers immediate therapy benefits. Like many people, you probably always have your smartphone close. 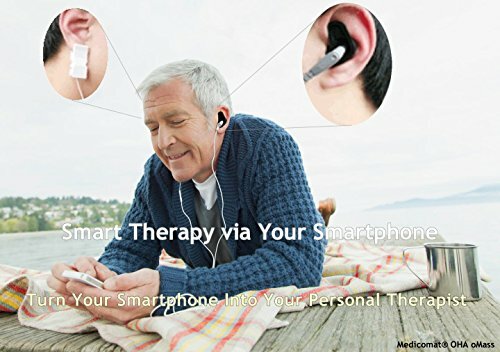 Now you can simply open an app, apply an ear pads and enjoy your acupuncture massage therapy. This unit is perfect for busy working professionals, stay-at-home moms, travelers, students, seniors, and more! Medicomat oMass has ability to display information in an intuitive way, its portability as a mobile-based device, and it is non-invasive. Medicomat oMass integrates data from TCM principles, acupuncture points, and reflex points to provide users the ability to retrieve health information quickly; allowing users to receive quality treatments at the tip of their fingers. Through a combination of the smartphone/tablet and the mobile-base device, we offer a convenient acupuncture massage machine to boost health, relieve pain, and increase body energy. Users can download the App easily from the Google Play Store or App Store and install onto devices for immediately using. Simply insert the ear-fitting pads into the ears and apparatus will fully automatically find and treat all that is needed through ear acupoints. The only thing the user needs to do is to adjust intensity to feel pleasant acupuncture treatment. System Requirement: Android USB OTG enabled (for Android Smartphones, Tablets) /USB OTG is short for 'USB On-The-GO', which is a USB2.0 supplement specification./ System Requirement: iOS audio and Mic enabled (for Apple iPhones, iPads with minimum iOS 7.0) This product is small and easy to carry. Directly plugged into the Micro USB (Android) or Audio jack (iOS) on the smartphone.